When I was a child, my mother used to make us her version of “Croque-monsieurs” instead of grilled cheese sandwiches. She would place ham or prosciutto in the middle of the cheese and grill it just like any other cheese. The saltiness of the ham gave it that extra special something – and now I can’t make it without! 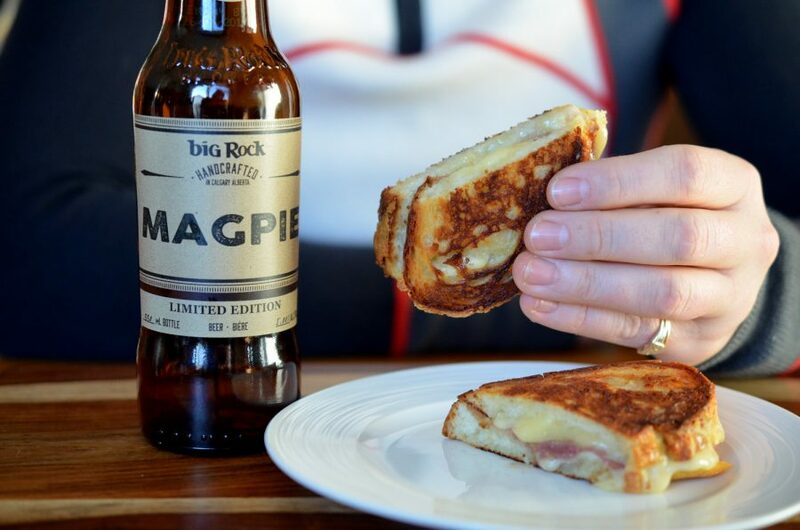 To help cut through the richness of the cheese, try pairing it with the Big Rock Magpie Rye Ale (find it here). The light malty flavours compliment the cheese and prosciutto while making the richness more approachable. Spread about ½ tbs butter on one side of each of the slices of bread. Layer the first slice of bread, butter side down, with 3 slices of gouda, the prosciutto and 3 slices of cheddar. This works best if the prosciutto is in the middle. Place another piece of bread, butter side up, on the top to complete a sandwich. Repeat with remaining ingredients. Place the sandwiches in the frying pan one at a time. Fry 3-5 mins a side until all the cheese is melted and the bread has a golden-brown crust. You can cover the frying pan with a pot lid to melt the cheese more quickly if desired. If the sandwich is browning too quickly, flip more frequently and lower the heat slightly.